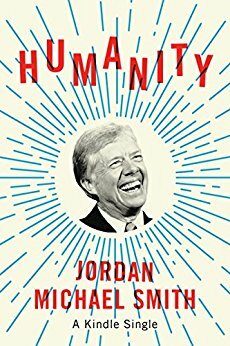 Jordan Michael Smith is the author of the bestselling Kindle Single, Humanity: How Jimmy Carter Lost an Election and Transformed the the Post-Presidency, and a former speechwriter in the New York City government. His writing has appeared in print and online for many national publications, including the New York Times Magazine, Washington Post, Wall Street Journal, The Atlantic, BBC and MSNBC. His profile of a professor who studies pedophiles was selected for inclusion in the 2019 Best American Science and Nature Writing anthology. Formerly a Contributing Writer for Salon and the Christian Science Monitor, he has appeared on many radio and television programs in Canada, the United States, Russia and Iraq. He lives in Brooklyn, New York. After living in the White House for four years, in November 1980, Jimmy Carter lost the presidential election to Republican Ronald Reagan in a landslide. Carter's unpopularity helped Republicans win seats in the House and gain control over the Senate for the first time in over 20 years. The Reagan Era had begun, ushering in a generation of conservative power. Democrats blamed Carter for this catastrophe and spent the next decade pretending he had never existed. Republicans cheered his demise and trotted out his name to scare voters for years to come. Carter and his wife Rosalynn returned to their farm in the small town of Plains, Georgia. They were humiliated, widely unpopular, and even in financial debt. 35 years later, Carter has become the most celebrated post-president in American history. He has won the Nobel Peace Prize, written bestselling books, and become lauded across the world for his efforts on behalf of peace and social justice. Ex-presidents now adopt the Carter model of leveraging their eminent status to benefit humanity. By pursuing diplomatic missions, leading missions to end poverty and working to eradicate disease around the world, Carter has transformed the idea of what a president can accomplish after leaving the White House. This is the story of how Jimmy Carter lost the biggest political prize on earth--but managed to win back something much greater. Stephen F. Cohen, Putin Dupe? What Did World War I Mean?